Miracle Max: It just so happens that your friend here is only mostly dead. There's a big difference between mostly dead and all dead. [...] Now, mostly dead is slightly alive. Now, all dead, well, with all dead, there's usually only one thing that you can do. The step in between Non-Lethal K.O. and Final Death. It took Jesus three days to come Back from the Dead, but for your party members all it takes is for you to fork over the cash. The procedure is relatively common in in-game mechanics, but possibly restricted to the wealthy. Game mechanics-wise, there's little difference between Only Mostly Dead and Non-Lethal K.O.. It's the general feel of the plot that is affected. Some writers feel that this cheapens death too much, or complicates Plotline Death, so they don't use this trope. On the other hand, it avoids the problems a Non-Lethal K.O. has with plausibility  a mighty robo-demon topples an entire flaming skyscraper onto you, and you are merely unconscious. Occasionally, a writer may put in guidelines to explain the difference between Only Mostly Dead and All Dead. This could be the amount of time that passed since death (the soul was still in the Afterlife Antechamber), or amount of damage to the body (Chunky Salsa Rule is virtually always All Dead without Deus ex Machina). Compare with Universes where the Necromantic can only ensure the dead Came Back Wrong. If you inflict a genuine Character Death and they're still "alive" in a manner of speaking, then you need to make them Deader Than Dead. Contrast with Almost Dead Guy, who is presumed to be a lost cause. Traditionally, if the characters believe the Almost Dead Guy can be saved, it is only due to Genre Blindness, and angsting will soon ensue. Not to be confused with Not Quite Dead. This may lead it to be a Disney Death. If this triggers something that was supposed to occur upon the character's death, it's the Revival Loophole. Given that this is a Death Trope, there may be unmarked spoilers. You Have Been Warned. Used as a plot device in Nano-Nano's path in Galaxy Angel II. Ash in the 35th episode of Pokémon (the real Safari Zone episode that was banned in America). This is the first episode that shows he is Made of Iron. Ash uses Pikachu as a Magical Defibrillator a lot. It happens again in the Lavender Tower episode, where he actually becomes a ghost for a short period of time. Celebi in the fourth movie. It takes the combined effort of every other version of it in every time period to bring it back. Horrifically averted with Zoroark in the 14th movie. It is blatantly clear that she really was fully dead and that Celebi's actions were a full resurrection instead of a simple healing. In Delicious in Dungeon, there's some kind of hard limit on how long a body can lie around before being revived, but the magic to do so seems plentiful and non-costly, at least in the dungeon itself. In fact, it seems to be an aspect of the dungeon itself, it cannot be done outside a dungeon. This is addressed by ex-party member Namari, who explains that losing even 1/13th of your body permanently (i.e. disintegration) causes Resurrection Magic to become far less reliable  and being turned to ash renders you permanently dead to all but the greatest Clerics. Heaven forbid you get shattered after you're petrified. While souls are chained to bodies after death, the bonds weaken over time, creating Spirits. However, the moment a Spirit is made manifest, resurrection becomes 100% impossible as there's no longer ANY connection between soul and body. Falin was barely hours or days away from becoming a spirit  Marcille's envisioning of the bonds keeping her soul tethered to her skeleton is that only one decrepit bond remains, necessitating the elf's use of Forbidden Magic. In Kenichi: The Mightiest Disciple, Kenichi himself is at one point 'killed' by Tirawit Kōkin, a disciple of Muay Thai. Although Ryozanpaku's ridiculously good medicine manages a revival, there are some other serious consequences that continue for quite some time. Later, Apachai, one of Kenichi's masters, was 'killed' and confirmed as dead by his rival Agaard (also Tirawit Kōkin's Master), and came back by 'asking a reaper for help' to protect Kenichi. Perhaps ironically, the early series used Apachai doing this to Kenichi as a Running Gag, showing Apachai's problems with the concept of "Holding Back". The 4Kids dub of Yu-Gi-Oh! treats the "Shadow Realm" this way. If characters are sent there, it's a Fate Worse than Death  but if the villain who sent them is defeated within a certain, non-specified period of time, then they are restored (although PTSD is a known side-effect). If they spend too long in the Shadow Realm, however, their minds will be completely lost. This is implied to be what happened to Marik's father (in the original, he was murdered with a knife). Happens to Tenma in Saint Seiya: The Lost Canvas after Hades effectively kills him. Turns out Tenma's soul is still barely connected to his body due to the flower bracelet his childhood friend gave him. In Naruto, this happens to both Naruto (by having the nine tails extracted) and Sasuke (by old-fashioned sword to the chest), almost simultaneously, courtesy of Madara Uchiha. Naruto's heart literally stops and Sakura has to pump it herself to keep him alive while they find a way to save him. Hayate the Combat Butler parodies this in an anime filler episode. 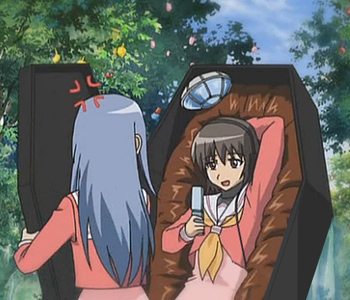 Risa dies in battle against a slime, but continues to hop around in a coffin after Izumi and Miki; taken to Up to Eleven later on with the coffin gaining equipment and weapons that Risa couldn't possibly use. At the climax of Fullmetal Alchemist, Father actually succeeds in his goal and absorbs the souls of everyone in Amestris not currently in his sanctum. However, Hohenheim reveals that he had prepared a reverse transmutation circle using the moon's shadow from the eclipse, and dots made of his own Philosopher's Stone souls, so that even if Father had the souls, the minds were still functioning as a link to their bodies, and ensured the souls would be pulled back to their owners, meaning that the seemingly dead inhabitants (which were technically still saveable even in that situation, provided rapid action was taken) returned to life when the aforementioned failsafe activated itself automatically. During part of the Buu arc of Dragon Ball Z, Gohan is thought to be dead. As the narrator mentions, however, he's at Death's door instead of fully dead (and he got better eventually). Frederica in Coffin Princess Chaika has impressive healing powers and "dies" quite often, but supposedly would die permanently if her brain were destroyed. Naturally, she does eventually get impaled through the head. When the other heroes find her seemingly lifeless body, a tiny version of herself rips its way out of her chest. She had, apparently, shapeshifted her real brain into a spare body, so that she could fake her death if necessary. She grows back to normal size shortly (no pun intended). Dangan Ronpa 3's Side:Future has the majority of Class-77 being comatose after the events of Super Danganronpa 2. All of the comatose students come back for the Side:Hope series finale. In addition, Side:Hope reveals that Kyoko Kirigiri, previously thought to have died during the Final Killing Game, was also in this state, and she is fully revived off-screen during the episode. It's revealed this is what really happened to Mavis in Fairy Tail. While Zeref's Curse of Ankhselam was able to "kill" her due to his love for her, because she suffered from the same Curse her immortality ended up putting her in a state between life and death rather than truly killing her like he thought. However, it took her years before her consciousness was able to regain enough strength to manifest as an astral projection, and at that point her body was trapped inside a powerful stasis Lacrima crystal and had become the container for a potentially-infinite magical source of energy in addition to having the same Walking Wasteland powers as before, so letting herself out wasn't exactly an option. In Detective Comics #64, "The Joker Walks the Last Mile", this is part of a plan for the Joker: after he is fried by the electric chair for all of his past offenses, his henchmen quickly retrieve his body from the prison morgue and bring him Back from the Dead with a life serum within 15 minutes in order to keep him from slipping off from "only mostly dead" to "all dead". Once he is revived, he walks away a free man... that is, until he is apprehended for newer robberies. Black Panther was once killed during a battle with Erik Killmonger. Though his friends were able to (just barely) resuscitate his body, it took Moon Knight venturing into the afterlife to actually bring his spirit back to the realm of the living. In Teenage Mutant Ninja Turtles (IDW), Donatello's shell is shattered by Bebop and Rocksteady and everyone initially thinks he's died. However, the Fugatiod detects faint signs of life and realizes that he's just barely alive. Acting quickly, they put his body into a cold room in order to slow down his biological processes, then upload his brain into Metalhead while they repair the damage  which includes an artificial shell. Many Redwall Fix Fics claim that Rose, Martin the Warrior's love interest, was Only Mostly Dead when she was taken back to her home. In Aeon Entelechy Evangelion, Shinji got into this state after Mot's counterattack. "Do not worry," Rei said, face emotionless. "He is only clinically dead." There was a pause, just enough for the black-haired woman to take a breath to respond, before Rei added, "He will get better." The Immortal Game: Rarity is mortally wounded during the Final Battle, with her heart being dissolved by Titan's magic. Twilight, having become an alicorn herself by this point, puts Rarity in stasis, keeping her preserved long enough for Twilight to give her a new heart and save her after Titan is defeated. In the Transformers fanfic Things We Don't Tell Humans, we discover that Jetfire is this after Transformers: Revenge of the Fallen. A shout out to the trope namer occurs in Hogyoku ex Machina by Unohana. In Tangled In Time, Ganondorf was mortally wounded by the Master Sword  but the Twinrova manage to save him in time since the sword wasn't removed from his body, and he wakes up decades after The Legend of Zelda: Twilight Princess. Seen in Cinderjuice and its sequels. Thanks to the Magically Binding Contract presented at the end of the first story, Beetlejuice is this; Lydia, by contrast, is Only Mostly Alive. She's accidentally been given a small portion of his powers over time, and the contract removes an equivalent portion of her humanity and gives it to him. The second story illustrates this with the yin and yang symbols. In Son of the Sannin, unlike in canon, Akatsuki's ritual to extract the Shukaku from Gaara is interrupted, so Gaara is left with a sliver of chakra that keeps him alive long enough for Naruto to transfer some of his own chakra and save his life. The Trope Namer is from The Princess Bride, wherein Westley, following torture to near-death by suction pump, turns out to be revivable  as long as the pill has time to work and he doesn't go swimming for at least an hour. In The Golden Child, Love Interest Kee Nang is struck by a crossbow bolt after Taking the Bullet for The Chosen One, Chandler Jarrell, forcing him to race against time to rescue the titular Golden Child so his powers can be used to save her. It's also played with a little. Her body is laid out on a table, with the sunlight shining on her through a window. Jarrell is told that as long as the sunlight touches her, she can be revived by the Golden Child, but if he takes too long, it'll be too late. After defeating Numspa and saving the Child, Jarrell notices sadly that the sunbeam has already moved past Kee Nang's body. Then the Golden Child walks over, props Kee Nang's foot back up into the sunlight, and revives her. The Invisible: Nick thought he was dead until he saw a bird hit a window, and its spirit stuck around only until its body finally died. Cue the race to find Nick's body. According to Congo, the ghost tribe has different levels of dead (presumably including catatonia as a condition where the spirit has left the body [death] yet the body still breathes). Only the last level is dead-dead. The British Hammer Horror film Wake Wood has the post-death caveat type  there is a ritual to bring a loved one back to life for a short amount of time, as long as the death didn't happen too long ago. A grieving couple bring back their dead daughter after lying about the length of time since the death. Hilarity ensues. In the movie Source Code, Colter Stevens is not quite dead yet. In Star Trek Into Darkness, Kirk appears to die in the containment chamber in Engineering from radiation poisoning after saving the Enterprise from crashing on Earth. He is then shown lying in an open body bag in Sickbay. But when McCoy figures out how to save himnote using Khan's blood, which he noticed had revived a dead tribble he gets a cryotube and has Kirk frozen to preserve his brain, revealing he wasn't quite completely dead yet. Transformers: Age of Extinction: Turns out getting an axe through what was left of his head, which was then torn off his neck, wasn't quite enough to put Megatron down for good, and he's able to survive long enough to transfer himself into a shiny new body. Justice League (2017): Bruce Wayne suggests this when he's talking about reviving Superman using a Mother Box. Diana argues against it and tells him to accept that Superman is dead, to which he answers that "we don't know what state he's in." Well, either way, you guessed it, they are able to bring him back. The Wheel of Time has several levels of being dead. Most people die and their souls are eventually reincarnated sans memories. The Dark One can also resurrect followers of his who die normally. Big heroes are bound to the Pattern and between incarnations they inhabit the World of Dreams where they retain memories of their past lives. When they're reincarnated, their new lives tend to be just as heroic as their past ones. Finally there's people who die via balefire, which kills you retroactively. Their souls can still be reincarnated according to Word of God, but they can't be resurrected by the Dark One. However, as a consequence of killing you before it hits you, anyone who was killed by you after your adjusted time of death gets unkilled, with some funny memories of dying. About the only Final Death shown is dying while in the World of Dreams. Dying there removes you from the Pattern so you can't be reincarnated. The entire premise of Altered Carbon, in which death and Real Death (or RD) are two separate concepts. Everyone is fitted with a brain backup implant called a cortical stack at birth. As long as it's intact, a person who dies can be resurrected into another body (provided they can fork up the cash for it). The eponymous Skulduggery Pleasant is this trope entirely. He was human but was killed in agony by Serpine during the war, then was burned and put in a bag - but it turned out (through Necromancer power that we find out about in Book 6) that he was only Mostly Dead, and as such was able to pull himself together and continue fighting. Mortal Coil has Valkyrie become mostly dead in order to have her true name sealed, in one of the single creepiest bits of the series. And that's saying something. Also applies to the partygoers in Death Bringer who were dead until their energy was returned to them. Harry Potter gives himself up to Lord Voldemort in an attempt to save his friends in the last book. Harry is hit with Avada Kedavra and his soul enters some form of limbo long enough for exposition from Dumbledore, but because Voldemort accidentally tied him to life by taking his blood, Harry eventually revives unharmed. Voldemort himself could count. He is hit by an unstoppable killing spell, but survives as a spirit 'less than the meanest ghost' because he split up his soul and hid the pieces in ordinary objects. He eventually returns to his whole body. In Terry Pratchett's The Amazing Maurice and His Educated Rodents, the titular cat, Maurice, uses one of his nine lives to avoid becoming "all dead". He also trades another of his lives to save Dangerous Beans from the same fate. In The Restaurant at the End of the Universe, famed Disaster Area frontman Hotblack Desiato is "spending a year dead for tax purposes". He still manages to eat at fine restaurants, travels the universe hooked up to his Death Support System, and employs a medium to translate his psychic impulses from beyond the grave into music. In Lonely Werewolf Girl the souls of dead werewolves go to the Forest Of The Werewolf Dead, fortunately Fire-Demon Malvera is able to intercept heroine Kalix's soul while it's just in the outskirts and bring her back. All for the bargain price of one human girl's ability to love. In book 2 it is revealed that Sarapen, the Big Bad from book 1 whose body was never found, is being kept in an Only Mostly Dead state, the end of the book has him about to be awakened. In the book The Princess Bride, Miracle Max actually first proclaims Westley "Sort of Dead." After a while, he notices something wrong, and the other characters ask him what it is. He then informs them that Westley has just slipped from Sort of Dead to Mostly Dead. George R.R. Martin's A Song of Ice and Fire series has a few examples of this. Lord Berric Dondarrion was brought back to life repeatedly by the Red Priest, although his regenerated form still had the wounds and scars from his death, most notably a huge hole in his chest left by a lance, and he gradually forgot more of his life with each subsequent revival. Catelyn Stark was murdered along with her son Robb at the Red Wedding, then later reappears, restored to life by the same sort of magic as Dondarrion. In a subversion, Catelyn is visibly rotted as a result of being resurrected several days after her demise. In the Warrior Cats series, Clan leaders are granted nine lives by their ancestors. When they receive a fatal injury or sickness, they'll stay dead for several minutes before waking up, assuming they have more lives left. This happens in Ghost Story when, after spending the entire book as a ghost, Harry attempts to move on, only to awaken in his still-alive body. Mab and Demonreach had healed Harry's mortal wounds while his disembodied soul wandered Chicago. In Dead Beat, the Enigmatic Minion Kumori Invokes this on a mortally wounded man, using Necromancy to bind his soul to his body until EM Ts are able to stabilize him normally. Main villains of Nightingale's Lament put a very popular singer into this state to keep her compliant and easily controlled. Since healing magic is an important (albeit rare) part of the setting, this is examined in depth. It's pointed out that most lethal injuries don't actually instantly kill, no matter how terrible they are; you have at least a few minutes until the brain dies. Until that happens, the Surge of Regrowth can be used to heal the person, apparently bringing them back from the dead. Once brain death occurs, however, death is permanent. Unfortunately, the setting also has Shardblades, which ignore living flesh and cut straight through the soul. If you are killed with one of those, you can still be revived if someone moves fast enough  but the window of opportunity is seconds, not minutes. Surgebinders holding Stormlight gain a powerful Healing Factor. As long as they have at least a tiny amount of Stormlight in them, it is impossible for them to die, no matter how terrible the wound. One character uses this to fake her death after getting her throat slit and then stabbed through the heart. Of course, healing also consumes the Stormlight, so it is possible for a Surgebinder to run out of Stormlight before they finish healing and die of the remaining wounds. This appears to be the effective status of the dead shardblades. Spren don't die in the same way humans do. Also, the spren of Adolin's blade has appeared to show more signs of life than usual such as saving Adolin's life of her own volition when he was in Shadesmar, telling him her name, and appearing in his hand on only seven heartbeats when he desperately needed her to appear quickly so might qualify as this by spren standards. In Torchwood, after Owen is killed and brought Back from the Dead by the second Resurrection Glove, he ends up in a state like this; he's clinically dead and all metabolism has ceased, but he is kept conscious and ambulatory (and non-decomposing) by residual Green Rocks in his system. How he manages to talk if he doesn't breathe is a question for Fridge Logic philosophers to decide. Played completely straight, and even quoted, in "The Big Bang". Amy, who'd been shot and presumably killed, was placed in the most secure prison in the universe  designed so that the person inside it could never escape, not even through death  and stored there until given a way to be revived. In "Hell Bent", Clara is extracted from her timeline in between her next-to-last and last heartbeat, and kept suspended in that moment while still being able to walk and talk and act pretty normally. So, she's right on the edge of dead, but not quite there. Aeryn Sun on Farscape qualifies for this - she drowns and is given a tearful burial scene. Then Zhaan, grieving, decides to give up her own life using her mystical Delvian powers and revive her deceased friend. Zhaan's able to do this because - yes! - Aeryn'z not totally dead! And in the Stargate SG-1 Tabletop Games, there are two degrees of death: merely dead, between -10 and -25 HP (revivable by a sarcophagus), and destroyed, below -25 HP (the body is messed up beyond repair). And certain species, such as the Unas, have the "Sarcophagus Incompatible" feat; for them, dead is dead. In Heroes, anyone with a Healing Factor is rendered "dead" if an object is stabbed into a certain part of the brain, but if it's removed, recovery is as quick as with any other injury. The characters believe that being shot in that part of the brain would kill such a person permanently, but it's never been done yet. Except since neither Ted nor Peter have hurt themselves while using that power at the lower levels, it shouldn't immediately follow that they'll blow themselves apart when going fully nuclear. In the alternate future of season 3, Sylar goes nuclear while standing a few feet away from Peter and Claire, both of whom are shown to survive. In the Pilot episode of Fringe, Walter suggests to Olivia that they communicate with the comatose John Scott by linking their minds. Walter: I have used this technique to extract information from a corpse once. You can do that if they haven't been dead for longer than six hours. Peter: Right, 'cause after six hours, that's when they're really dead. Charlie does this in Lost. At least, that seems to have been the case, since Jack finds him hanged yet manages to resuscitate him. Mikhail has been Only Mostly Dead a few times. Buffy is killed, she is brought back by a magical ritual. Buffy in "Prophecy Girl," after the Master drowned her. Buffyverse has a good few levels of dead including but probably not limited to: vampire/demon possessed corpse, mummy/zombie/reanimated corpse sans demon, ghost, resuscitated, dead but brought back by magic, dead and beyond being brought back by magic (e.g. Darla), whatever the heck happened to Cordelia. Mulder makes a regular habit of this in The X-Files. The most noteworthy occurrence is in season 8. It went so far that his body started decomposing and he was buried with a funeral and everything, only to be dug up three months later and found to be only mostly dead. 7Days: A backstep goes wrong (of course) due to sabotage, which kills Frank...mostly. He's still a ghost, and when a Blind Black Guy is able to hear him Parker manages to save the day by backstepping again. In the Supernatural episode "All Hell Breaks Loose, Part Two" (S02, Ep22), Dean claims that this was Sam's state, but that Bobby patched Sam up. Maleficent is this in Once Upon a Time. Regina was extra angry with her when she trapped the Enchanted forest residents in Storybrooke, so cursed Maleficent so that she could never die. She's seemingly killed by Emma in the first season finale, but returns in season 2 as a phantom that attacks Killian. By season four Cruella and Ursula are able to revive her. The first time was when Mebius and Taro were battling against Imperializer, when Mebius takes a powerful blast from the robot while protecting GUYS from its assault. Mebius's Color Timer goes out and Mebius seemingly dies then and there. He gets better however after the members of GUYS cheer him on and remind him of the promises he made to them as a human (Mebius, as Mirai also had revealed his secret identity to them shortly into his fight with the robot,) and with it, Mebius also gets a new power-up that helps him win the day. The second time (and most legit of the examples) was when Mebius was Killed Off for Real by Alien Emperor, while GUYS laments that they cannot beat the Emperor without Mebius's help, now it's the Ultras of the Past reminding them at it was because of their faith in Mebius that kept him going and with them renewing it, Mirai returns to them, now as an entity stored away in Ultraman Hikari's Knight Brace, (which was given to him by Ultraman King.) Like before though, with their faith and Mirai/Mebius's faith is renewed, it allows the Ultra to come back to life with an even stronger form than before. Old-school RPGs based on Dungeons & Dragons rules often had relatively easy resurrection at shrines/churches for those willing to "donate." "Unconscious", at exactly zero hit points and can be restored with any sort of healing. "Dead", requires a "Raise Dead" or "Resurrection" spell to restore; caused by having -10 or less hit points. Which one you need depends on whether the corpse is in one piece or not. "Gone", results from a failed raise, death from disintegration or dragon breath, or having the party flee from battle when the character is laying unconscious, bleeding, or dead on the field. Restoring the character from this typically requires nothing less than a "Wish" spell or divine intervention. The tabletop games have multiple levels of 'Mostly Dead', depending on edition, the power of the spellcaster, and what spells the spellcaster knows. This means that in 3.5 the smallest possible 'Mostly Dead' is less than nine days dead, cannot be missing vital parts of the body, can not have been turned into an undead or have been killed by a death effect, and must not have died of old age, while the greatest (assuming that one does not get into supplements or epic-level stuff) requires that the death was not of old age, that it was less than 200 years ago, and that the deceased can be unambiguously identified in some way. Hack Master builds upon the AD&D second edition rules, and imposes the limit that a character's starting Constitution score represents the number of times they can be resurrected; this total can never be raised short of the personal intervention of an actual Gawd. Some games have a different kind of "Mostly Dead", meaning that the character is unconscious and unresponsive, but not actually dead yet and still capable of being revived by "normal" (i.e. magical) healing processes. For example, in some editions of D&D, there's a reserve of 10 "negative" hit points, and you don't actually die die until you hit -10 HP. Any magical healing you receive while in the -9 to 0 range takes you to 0 HP and then adds HP normally. It's also possible to use the healing skill on such a character, which doesn't actually recover any hit points but does stabilize them and keep them from getting any worse (unless they get hit again). In some editions there's a feat characters can take that allows them to remain conscious and active with negative hit points, but -10 is still dead. If a character is "zeroed out" in Swashbucklers of the 7 Skies, he is literally "mostly dead", as a nod to the Trope Namer, and to swashbuckling fiction in general. Killing an unconscious or helpless foe is Bad Form, even among villains. In the FASA Doctor Who roleplaying game, there is no point of death, only a slowly increasing modifier to the difficulty of bringing someone back. Eventually you just have to give up. Genius: The Transgression: Actual resurrection of a dead body is not only a scientific sin that will ding your Karma Meter, it's an open invitation for a Monster from Beyond the Veil to make your life harder. However, when it comes to mad science, if the person died less than an hour ago, not of old age and not of head-applied Chunky Salsa Rule, it doesn't really count as dead, and you can bring them back with neither of those problems. "Dead", which could possibly be cured with a simple "Raise Dead" spell. "Gone", where nothing other than hacking the game will bring them back. At the time, there weren't that many hackers, however, if one sent their character disk to the game developers; they would bring them back and send the character disk back. Provided they be allowed to use the previously wiped out party as enemies in Wizardry IV. Pikmin has multiple endings. The Bad End happens if you don't manage to collect at least the 25 necessary ship parts within 30 days; Olimar, unable to take off with his spaceship, dies (offscreen) from oxygen poisoning, but his corpse is brought to an Onion by the Pikmin, thus reviving their "leader" as one of their own kind, turning the situation into slightly creepy Disney Death. In Final Fantasy Tactics, any defeated characters would fall over with a turn-counter above their heads. If a Raise-spell or a Phoenix Down is adminstered to them before the timer runs out, they return to life - they are Only Mostly Dead - but if the timer runs all the way out, they are Killed Off for Real. If this happens to any plot-important characters, it's Game Over. Interestingly enough, the same rules apply to all enemies... while Undead types may actually come back to life on their own after the timer runs out, unless a special spell is used to permanently destroy them. In Final Fantasy Tactics Advance this was altered: If a character (other than the protagonist) is defeated, he is merely knocked unconscious, and can either be revived during the battle or automatically after it's over. However there are certain areas in the game called "Jagds" where if a defeated character isn't revived before the battle is over, then they are Killed Off for Real. The plot explains this by saying that conflicts in these areas are not overseen by the Judges, and can therefore turn lethal. The heroes tried the full range of Phoenix Downs, Life spells and such during the Plotline Death in Final Fantasy V. It didn't work. KIA: Exactly What It Says on the Tin; they ain't ever comin' back, and you have to make do with subpar replacements. In later games, lesser teammates are never killed, only Non-Lethal K.O., but if Ding Chavez gets KO'ed, he is Killed Off for Real, and it's Game Over. In games with Magical Defibrillators, this happens when you're brought down by gunfire or other non-Final Death means, but only lasts until you respawn. Occasionally results in cases of people "dying" repeatedly by headshots and massive explosions, to be zapped back to full health moments later. Might and Magic 6, 7, and 8 have three stages of Death: Unconscious, when HP is below 0; Dead, when negative HP exceeds the inverse of the character's constitution; and Eradicated, a condition caused only by certain late-game attacks, and being so powerful that it "destroys the body", but not their weapons, armor, or inventory. Each condition only differs in the cure. Unconsciousness can be remedied by any source of healing, but Eradication can only be fixed by end-game magic or a temple. In Persona 4, the silent protagonist may revive himself with a number of moon tsukubames in his pocket, depending on the difficulty selected. At a certain event in the game, the character's choices determine whether 7-year-old Nanako remains dead, or miraculously revives herself with some apparent help from Teddie. In Treasure of the Rudra during the battle with Nagiya, one of the Four Horsemen, Foxy is hit with an attack called "Foxy Killer" and cannot be resurrected until you get a certain plot related item. After a certain (Early) point in FPS Prey (2006), it's simply impossible to die. Upon losing your last drop of health you're simply sent to the spirit world where, rather than move on to the other side you're granted a brief moment to restock on health and spiritual energy by shooting the conveniently color-coordinated spirits before being reunited with your mostly dead body. However, this simply negates Check Point or Save Point attrition with death attrition. With enough deaths, you can grind your way past any situation. This is arguably still an improvement, however, as playing a shooting gallery Mini-Game with weird undead creatures, then jumping back in where you left off is probably more fun than being sent back to your last save/checkpoint and having to work your way back to your original location. Assuming you remembered to activate them beforehand, the "Quantum Bio-Reconstruction Devices" in System Shock 2 would resurrect the player if he died anywhere within the level they were located on. Not found in the climactic final level, of course. The original System Shock had something similar in the form of automatic healing devices that are converted to cyborg conversion chambers. By deactivating the cyborg process, the healing process is reactivated without the enemies knowing. So when you die, you just wake up in the healing chamber with no one the wiser. Of course, some of them were easy to find but extremely difficult to activate, and at least six of the games thirteen levels don't have healing devices at all. In BioShock and BioShock 2, every time you die, you are revived at the nearest "Vita-Chamber" with some of your health restored, though your enemies' health stays the same. In both games, there is an achievement for beating the entire game on Hard with Vita-Chambers turned off. And you are returned to the opening screen when you die, Loads and Loads of Loading away from resuming at your last save point. A fate worse than this particular death. The Sims 2 University expansion pack introduced the Resurrect-O-Nomitron, which is unlocked when a Sim completes a certain career path and allows them to summon The Grim Reaper and attempt to buy back any Sim (or pet!) whose tombstone is still in the neighborhood. If the tombstone's been sold or destroyed, though, they're gone for good - and if Grimmie doesn't like what you're offering in return, you may not like what you get back. Throughout the Dragon Quest series, monsters overcome in battle are described as "defeated". This rule does not apply to your own party, however — when a character is reduced to zero HP, the game announces, "(Character) dies". In addition, monsters dispatched by the instant-death Whack and Thwack spells are explicitly described as "killed". Dead party members were put in coffins and carried by the remaining party members. (The American Bowdlerization changed this to ghosts.) Dead party members need to be revived at a church, with a special item, or high-level magic. In the Dragon Quest V remake, wedding vows include "in sickness and in health, and for as long as you both shall be resurrected from death in a church." In Ultima III, if someone was so gone that they have since then reincarnated, there is still a spell that brings them back anyways. Presumably, the baby they had become drops dead. There is a cost of the wisdom stat to the caster, though. Class Of Heroes, which is largely inspired by Wizardry, has the same three stages of death (Dead, Ashes, and "Lost"). It is possible to pay the doctors at the infirmary to revive a character who has been turned to ashes, but the cost is three times as much as it is to revive a character who is simply "dead". And if that fails, well...you'll just have to enroll a new level 1 character, won't you? Final Fantasy IX: There are two ways to "die" in this game: KO from HP loss, and being Stopped. KO can be remedied via the usual tactics, but Stop cannot be reversed until the spell wears off on its own. If all characters are stopped, it's Game Over. Referenced in Mass Effect 2, which starts with Shepard dying and being painstakingly revived by Cerberus over two years. Later, when asked about it, one possible response is, "I was only mostly dead. Try finding that option on government paperwork." Alyx in Half-Life 2: Episode 2 was dead enough for a Combine Hunter to credit it as a kill (although why it ignores Gordon is uncertain). However, she isn't too dead for the Vortigaunts to render assistance. Similar to the RPG examples above, the Exile system has "dead", "dust", and "stone" statuses. "Stone" was relatively rare, being applied only by certain special monsters, and reversed by a spell. "Dead" was the common form of death, reached by being hit to 0 HP and then hit again while on the brink of death (if you were at 1 HP and hit for 100, you still lived - until the next swing), and could be reversed by the Raise Dead spell - but if it failed you were dusted. "Dust" could also be caused by an excessively powerful kill-shot, and was much harder to reverse. Assuming you didn't cheat, anyway. In Left 4 Dead 2, if one of your teammates dies they can be revived with a defibrillator regardless of how much time has passed since their "death." While many fans attribute this to a Magical Defibrillator, others believe that the character is instead Only Mostly Dead. The latter is more likely, considering it can't be used on the one character who actually does suffer a Plotline Death (poor Bill). In World of Warcraft, players can be resurrected for the cost of a bit of mana, or by running their spirit back to their corpse. NPCs are slaughtered by the thousands, but respawn minutes later (or every week in the case of raid bosses). The only final deaths are dictated by the plot, and you can be sure that if the plot requires someone to die for real while you watch, you can do nothing to save them. Even in the storylines, you occasionally see a character previously you saw killed in front of you be standing before you, very much alive. (And we're not talking respawns of the same character, we're talking about later events involving the previously "dead" character.) When it's a boss, often you'll get the line "[previous location] was merely a setback!" In Metal Gear Solid 4, Big Boss is revealed to have been sealed away in a coma for 15 years after his "final" battle with Solid Snake, having been snatched away by the Patriots, his legs and arms amputated and his consciousness locked away with nanomachines. As it turns out, that was actually Solidus Snake, who is physically identical to Big Boss aside from the fact that the eye he lost is on the other side of his face. Big Boss shows up in the ending later with new cybernetic limbs (as well as replacement limbs from his sons, Liquid and Solidus) to let Snake know that he shouldn't spend his last days as a soldier. He finally succumbs to FOXDIE at the end of his speech to his son. Dungeon Siege has resurrection shrines scattered about multiplayer mode, as well as resurrection spells that Nature Mages can use to revive a dead character. Carries over into Dungeon Siege II with the addition of Resurrection Scrolls that any character can use, as well as NPC's at the various major towns to summon your corpses (and the gear you were using at the time) for a fee. Alternately, you can go back to where your party died at and recover the equipment manually. Dungeon Siege II: Broken World introduces enemies called Familiars that, once they hit 0 HP the first time, fall down as if dead for a few seconds, then spontaneously revive in a blast of energy, badly damaging any characters unlucky enough to be caught in the blast. Quite the nasty surprise for newcomers to the expansion. There is also a fourth level in multiplayer games: "Ghost". Ghosts revive if they find a resurrection shrine or after a set period of time automatically. Baldur's Gate II: Throne of Bhaal addressed this point by having the character Imoen ask Sarevok what it was like to be dead. He pretty much responds with a "Pfft, like you've never been dead before," suggesting that in the game (rather than as in the Forgotten Realms) there's a distinction between Raise Dead dead and dead dead. Dead. In fact, Imoen confirms this, as she recounts what it's like being "dead until the priest gets there". Shortly after the beginning of Shadows of Amn (the game T.o.B. is an expansion pack for) the party discovers Jaihera's husband Khalid lying on a table horribly tortured to death, sending his widow into a traumatized fit of grief. When Imoen suggests using a resurrection spell, the widow replies that "some things can not be fixed by magic". The implication is that the body is seriously damaged due to Irenicus' 'experiments', which is actually a nice aversion of Gameplay and Story Segregation — in D&D, a corpse must be whole for revival magic to function, and a character that is reduced to less than -10 HP in the Baldur's Gate series is 'chunked' and Killed Off for Real. Not everyone takes it so seriously. "Greetings, everyone. Sorry, no gifts or souvenirs this time but I'll keep you all in mind the next time I'm gone. Oh, Keldorn, the gods say 'hi' and that you should wash your underwear more thoroughly. Everyone ready? Let's go adventuring." Yes, this is said by someone brought back from the dead. Due to your character's...unusual heredity, your character is the exception; dead is dead is very, very dead. Sadly this leads to some retcon-induced Fridge Logic with regard to Imoen. A lot of entities also seem to be Not Quite Dead in the series. The most notable of course being your daddy who keeps talking to you despite being long dead and gone. This seems to be par for the course for his class of beings though as Amaunator, dead God of the Sun does similar things. Most units in S.W.I.N.E. will merely lose their turret and the ability to move. This allows players the ability to recover "lost" units and bring them back into service with a repair trailer. There are a few exceptions to this, but all but one of those are non-combat units. It's fairly easy to go along with it, as all the units in the game are some sort of vehicle. Sonic the Hedgehog (2006) has Sonic killed off by the Big Bad, except not really due to the princess detecting the fallen's spirit lingering around and everyone then deciding the Chaos Emeralds can bring their friend back to life. It does. Fallout Shelter: Dead Vault Dwellers can be brought back to life if you stump up the cash. In Undertale, part of a monster's natural death process is a comatose period, known as being "fallen down". Monsters that have fallen down will eventually turn into dust, but they're technically still alive, as proven by experiments documented in the True Lab that unexpectedly brought some monsters back from this state, sort of. In Girl Genius, Adam and Lilith Clay are ripped to pieces by Von Pinn. They are later resurrected by Agatha's love interest Gilgamesh. Of course, they are constructs, built by the Heterodyne boys. However, dialog elsewhere in the series makes the rules for being Only Mostly Dead more clear; having your brain incinerated, for instance, is described as being a Final Death, while one character notes that even aside from that resurrection techniques usually don't work so well. Also, if you're a member of the nobility, being killed causes you to lose your status (rulership or Xth-in-line-for rulership), even if you are successfully resurrected. "So, the good news is, you're alive again. The bad news is ... well, here are the want ads." Baron Wulfenbach doesn't respect this rule, though. The Adventures of Dr. McNinja has a ridiculous parody of an example: Doc appears to get shot to death, and collapses to the ground, riddled with bullet holes. Shortly after this, it turns out he's perfectly fine, supposedly because the bullets missed all his vital organs. At least, that's the excuse he gives to Death, who doesn't buy it. So Doc beats him up and declares his own previously fatal injuries to be Only a Flesh Wound. Schlock Mercenary: Referenced. Any injury other than damage to the brain is repairable, so the characters can be (and have been) reduced to just a head in a nannybag at one point or another, before having your body rebuilt. This is apparently referred to in the UNS military (although not among the mercenaries) as being "mostly dead." Later advances in technology lead to there being five levels of "dead", Laz-1 to Laz-5, explained here. Laz-1 is 20th Century dead - cessation of brain-stem activity. Laz-2 is Laz-1 plus damage to brain-tissue. Laz-3 is total loss of brain, but distributed nanite-backups are intact. Laz-4 is Laz-3 with significant damage to the backups. Laz-5 is complete loss of identity and memory beyond retrieval by technology so far. Roommates is generally a Nobody Can Die work, but is also a Massive Multiplayer Crossover Meta Fic soooo it runs on two main powers: (1) Clap Your Hands If You Believe (mostly the fandom's) and the (2) Theory of Narrative Causality. If you have both on your side you're obviously alive (even if the story calls it differently). If only (1) then you are "Canonically Dead", which means this trope, you can come back just don't go close to a narrative that wants you not breathing (this is why Death by Origin Story works). If only (2) then pray that you never have to leave your story or you are as good as dead. If neither you never existed in the first place. In Kill Six Billion Demons, the first Demiurge Zoss massacred most of the Prime Angels after breaching Heaven, leaving one barely alive to torture for information about the Gods. Since this left it trapped on the verge of death in a broken body for millennia rather than trigger its Resurrective Immortality, it's gone a bit wrong in the head. Gloomverse: What happens when your wand breaks. In the MMORPG for Gaia Online, if a player loses all health they they are "dazed", which leaves them unable to attack, open chests or crates, move to another screen, or really do anything besides use the chatbox or wander around drunkenly. The player can be saved from this state by clicking the "awaken" button which whisks you to a place called the Null Chamber (thanks to the mysterious attack rings), using a potion, or having another player use a reviving ring on them. Superman turns out to be this in Superman: Doomsday. Oh, come on, like it's really a spoiler that Superman doesn't really die. This occurs in Justice League Unlimited when Flash taps into the Speed Force to defeat Nigh Invulnerable foe, "Brainthor", and appears to fade from existence, for good. After a few brief moments of hopelessness, it is revealed that Flash is still alive, but continually regressing and his dreaded demise appears inevitable, so the remaining core seven decide to ''pull'' him out of the Speed Force. Cryonics patients, they hope. They arrange to be frozen after death, in the hopes that someone will eventually discover how to thaw them out and make them live again. With the problematic aspect that the freezing process either involves their brain cells exploding or their systems being flooded with toxic chemicals that would kill them if they weren't already dead. Clinical death means that the heart and circulatory system has stopped functioning. Up until the 20th Century, this was the official definition of death, and even today it usually means your ticket's been punched. However, if the proper action is taken (ideally within seconds after death - the brain starts to die off almost immediately under these conditions), it's possible that the heart and circulation will restart - if the patient's really lucky, without permanent damage. During major open heart or brain surgery, the patient is intentionally put into clinical death - heart is stopped, life support connected. By usual definition of death, the patient is dead, hopefully, just until the circulation is restarted. Only from the early 2000s did this kind of surgery become usual and routine. At least if the hospital has state-of-the-art equipment and the surgical team is among the best.